The opposition leader Abdel-Jalil said rebels have now captured three of Gadhafi’s sons. He said they detained al-Saadi Gadhafi on Sunday night along with his brother Seif al-Islam, the one-time heir apparent to his father. TRIPOLI, Libya (AP) — Libyan rebels claimed to be in control of most of Tripoli Monday after their swift advance on the capital heralded the fall of Moammar Gadhafi’s 42-year regime. But they still faced some fierce resistance, with scattered gunbattles erupting, and the mercurial leader was nowhere to be found. 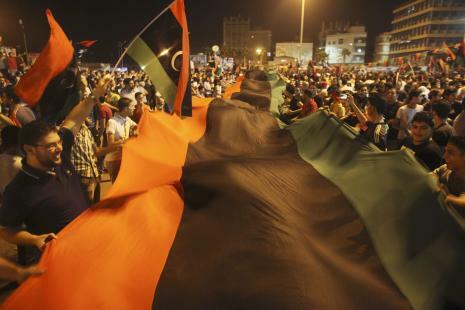 The international community called on Gadhafi to step down and moved ahead with post-war planning as euphoric rebel supporters celebrated in Green Square, the symbolic heart of the fading Gadhafi regime. Colleagues warned the leader would not go easily, even after three of his sons were arrested. “The real moment of victory is when Gadhafi is captured,” Mustafa Abdel-Jalil, the head of the rebels’ National Transitional Council, said at a news conference in the opposition’s de facto capital of Benghazi in the east, hundreds of miles from Tripoli. NATO vowed to keep up its air campaign until all pro-Gadhafi forces surrender or return to their barracks. The alliance’s warplanes have hit at least 40 targets in and around Tripoli in the past two days – the highest number on a single geographic location since the bombing started more than five months ago, NATO said. Revelers flashed the “V” for victory sign and motorists circled the plaza, honking horns and waving rebel flags.